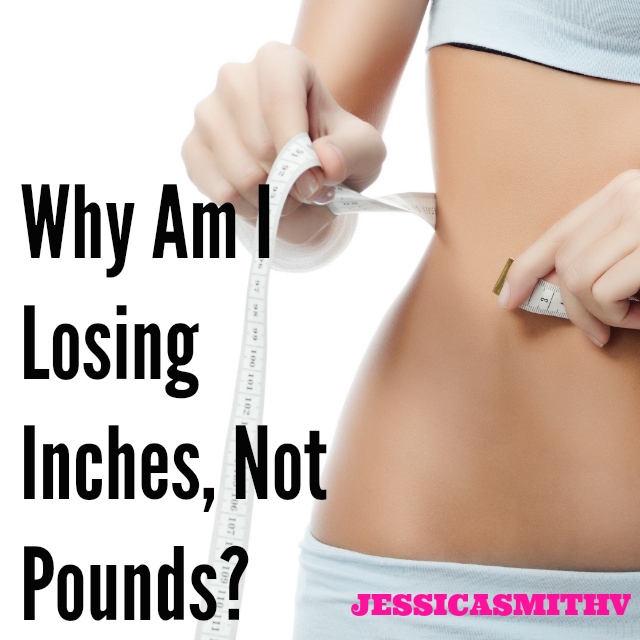 Ask Jessica: Why am I losing inches, but not pounds? When it comes to the scale, it’s important not to take the number too seriously. “The human body tends to have a favorite weight that it functions most efficiently at,” explains Dolgan. Scientists have termed this phenomenon the “set point” theory, which means the human body will adjust the components of mass to keep within a certain range. This allows for our center of gravity to stay the same and is helpful in maintaining biomechanical function, says Dolgan. Instead of worrying about the scale, says Dolgan, you should pay attention to your body composition instead. If you haven’t had your body fat tested yet, it may be a good idea to have a professional take this more objective measurement for you. Remember that you can be at a “thin” scale weight and still have a high level of body fat, which is not healthy! The changes in your body composition can tell you a lot more about the changes happening within your body (if you are building muscle for example) than a number on the scale. In looking at your current workout routine, Dolgan noted that although you are not completing any “traditional muscle building” activities, plyometric exercises place a large load on muscle mass and could be causing hypertrophy (muscle mass increases). Dolgan says, remember that different people can build muscle at different rates. “This is mostly a product of which type of muscle fiber is dominant in an individual’s body. Type I muscle (slow twitch aerobic) doesn’t tend to grow as much or as rapidly as Type II muscle fiber (fast twitch explosive). Plyometric training will predominantly train type II muscle fiber.” It’s important to train both within a balanced fitness plan. You also mention using hand and ankle weights during your workouts, which I would advise against. Strapping on a weight near your joints can cause excess strain and wear on your joints and don’t target the muscle as effectively. Instead, start incorporating the use of dumbbells and or resistance bands for better, safer results. I’d recommend adding 3-4 strength training sessions per week to your routine. And, if I read your note correctly, you mention doing two 50-minute sessions a day, which in my opinion, seems a bit much! You may actually find the scale start moving in the right direction if you try a bit less — alternate your high and low intensity training days and choose one workout (20-60 minutes in length) a day and see how that works for you. We tend to forget the power of rest and it could be what is missing in your workout schedule. Plus, you may find that you have more energy to keep active during the remaining hours of your day, which can help you burn more calories around the clock! It’s also so important to note that what you eat plays a huge part in changing your body. Sometimes there are daily habits that could be adding extra empty calories that we don’t even realize are stalling weight loss. Take a look at your daily consumption and look for any small changes (I don’t advocate any drastic, restrictive cuts!) that you might be able to make to be even healthier. Keep taking great care of your body Michele! Hopefully some of this advice will resonate with you and help you reach your goals. And don’t forget to celebrate what you’ve already achieved! Not only do you have a healthy little boy, you also have lots of energy and dedication too. Keep up the great work! Got a question for me? Post it below and I may answer it in an upcoming post! I’ve just done my first week of exercising with Jessica, I find your routines by the way great! I have been eating healthier but I could have been much better than I have. I was mortified to get on the scales this morning and have put 2lbs on! Thankfully I’ve just measured myself and based on measurements I did a month ago, I have lost 1.5″ off my waist and 1″ off thighs so I now feel much better! I have been working out daily, I walk a mile to a mile and half, (walk/run) at least 4 to 5 days a week, I have noticed my clothes are fitting lose but I have not loss any weight, I am up to a 1 minute plank, wall squat is 2 minutes and stretching, what can I add to start to see weight loss. Oh yea i am 54 years old and menopausal. please help!!!! I have this problem too. Thanks for posting this! Good to know! !